If you work in forestry or as a remote worker, then you know some of your activities are more high risk than those undertaken by people working in offices. 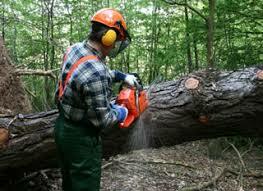 The statistics for accidents in forestry and agriculture indicate this is a dangerous sector to work in. For this reason, the Forestry Commission has for a few years now required contractors and staff who work in their sites to have first aid training with some special add-ons. This has become known as +F First Aid (+Forestry First Aid). This email series of newsletters will take you through the additional requirements of a +F first aid courses. It does not replace going on course, but it it will give you the theory and background to know what the topics required for +F training are and good theoretical knowledge of those training requirements. The course is divided into five email newsletters which will be sent to you over the next week. By sending this contact form you agree to opt in to being contacted by us about updates to First Aid regulations, relevant first aid events and other first aid related information that we hope you find interesting and useful. We'll never share your data with anyone and you can unsubscribe at any time.